Been itching to write a book but not sure where to start? Or in the middle of one but stuck on what's next? 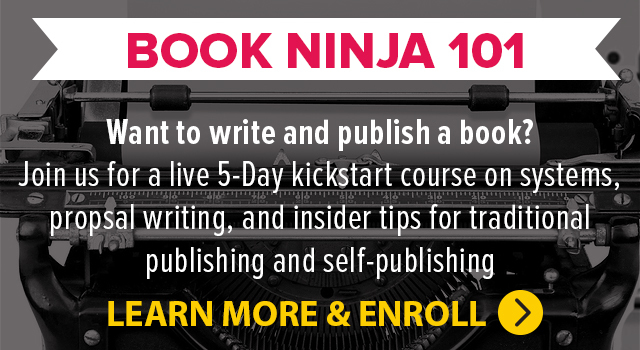 Join this week-long The (He)art of Book Publishing for soup-to-nuts practical, tactical tips for generating momentum and getting published. As one of my book mentors Michael Larsen once said to me, "It is no longer a question of if you will get published, but when and how." This course includes five recorded workshops, along with a 20+ page guide and free templates for everything from proposal-writing to seamless marketing. Day 1: Systems for Outlining, Researching, Writing, and Editing—Fresh off a three-year marathon of writing Pivot: The Only Move That Matters Is Your Next One, I will share my best tips and tools for every stage of the book writing process: how to organize ideas and research, outline the book, chunk writing into bite-sized essays, and how to get unstuck when you hit book block. Day 2: Craft a One-Page Book Pitch with Jennie Nash—Jennie will introduce her simple tool for harnessing your idea, framing your marketing strategy, and knowing how to answer when someone says, "What's your book about?" Day 3: Traditional Publishing Q&A with my editor at Portfolio/Penguin Random House, Natalie Horbachevsky—A conversation with my genius editor, Natalie, in which I get to ask everything I have always wanted to know too! We will dig into tips for landing a coveted “Big Five” book deal, what she looks for in terms of platform, what types of big ideas are most appealing to publishers, her role as editor throughout the process, what motivates her to proactively reach out to an author (scouting), and if self-publishing first helps or hurts. Day 4: Self-Publishing Success with Taylor Pearson—An in-depth conversation with Taylor Pearson about self-publishing his book The End of Jobs to smashing success—how he sold 5K copies in the first month, 12K to-date, made $35K in resulting revenue, and grew his list by 500%. For a sneak peek at what he will be sharing, check out his post Jesus Marketing. Day 5: Open Q&A with Jenny (+ Special Bonus): Map what's next for your book project, and ask me anything that is still on your mind. We'll also do a round-robin sharing (optional) for committing to next steps. All members of the course and the Momentum Community will receive access to my super secret work in progress, the 20+ page Behind-the-Book toolkit, including my proposal template that landed the Penguin deal, my writing tracker template, book tour planning process, and more. Or get the course for free when you join Momentum, which includes twice monthly Q&A calls with me (including two years of archived calls), every course and template I have ever created ($1,000+ value), and live monthly workshops with featured guest experts.